Private hospital rooms are a big deal. “A huge patient satisfier,” said Tara Mosley, manager of patient care for the Medical Acute Care Unit (MACU) at OSF HealthCare Saint Francis Medical Center in Peoria. But 24/7 isolation isn’t the goal. Patients need stimulation. Research shows diversional activity can reduce agitation and anxiety, as well as help prevent falls. Social interaction also produces benefits. So Tara and her supervisor, Samantha Jackson, came up with the Patient Activity Room to serve the men and women who occupy the 20 beds in their unit. On Valentine’s Day, sunlight poured through the six big windows and brightened the pink plastic cloth adorning a long table in Room 1756 at OSF Saint Francis. Construction paper, marking pens, scissors, ribbons and tubes of glitter glue were spread across the table. Music played in the background. Maureen, a MACU patient that week, took a seat at the table moments after the activity room opened. 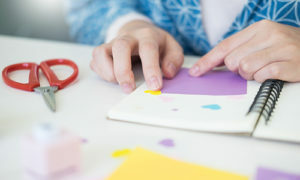 She ate her lunch, then began making Valentine cards that would be given to kids at OSF HealthCare Children’s Hospital of Illinois. Because the room doubles as a family waiting area, it already was equipped with kitchenette and vending machines. Couches, lounge chairs and even a rocking chair ring the room. There’s a flat-screen TV and DVD player. Cabinets are stocked with movies, books, magazines, puzzles, board games, decks of cards, craft supplies and, of course, Bingo. Mission Partner donor drives provided the materials. Each item must pass infection-control protocols before it’s used. Some items – such as magazines, books, puzzles and things made of cloth – can’t be wiped and, therefore, can be used only once. So there is an ongoing need for donations to replenish supplies. The official hours for the Patient Activity Room were set for noon to 4 p.m. Monday through Friday, and the original criteria required at least four patients to open the room. But that has been re-evaluated. While researching, Samantha was surprised to find few examples of activity rooms in traditional hospital settings. Most were in pediatric units or nursing homes, she said. “The activity room is a place patients can go and congregate and do activities together,” Tara said. “That increases their well-being. It gets them active and moving, and decreases their risk for pneumonia and their risk of falling. 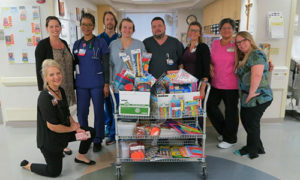 To donate items to the Patient Activity Room, contact Tara at Tara.L.Mosley@osfhealthcare.org or (309) 624-6036; or Samantha at Samantha.J.Jackson@osfhealthcare.org or (309) 624-6038. Kirk Wessler started work as a writing coordinator for OSF HealthCare in January 2019. A Peoria native and graduate of Bradley University, he previously worked for newspapers in Missouri, Texas and most recently at the Peoria Journal Star. Kirk and his wife, MaryFrances, have five sons, four daughters-in-law and eight grandchildren. He’s on a quest to master playing guitar and golf. He also loves to travel, especially driving back roads.